Learning a modern second language is important these days and the easiest way to learn a new language is through day-to-day life immersion. Since we can not jet off to a Spanish speaking country for that immersion experience we have been using Spanish for You! With easy to use lesson plans these lecciones teach all the vocabulary and grammar needed broken down and scheduled out for a 4-day week in 24-30 week plans. Check out a sample week by clicking HERE and for a sample worksheet click HERE. Spanish for You! is available in different configurations, allowing you to figure out what the best level is for your families needs. Each theme set includes materials for all grade levels and retails for $64.95. Grade level specific packages that contain only the files needed for a specific grade level – 3rd-4th, 5th-6th, or 7th-8th retails for $39.95. The same text is used for all three levels, however, if needed extra textbooks are just $12.95. Teacher lesson plans for use in a classroom setting retail for $12.95. 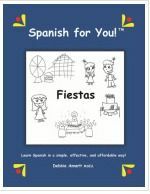 I used the Fiestas program with Mikayla who is in 4th grade. We worked through the material 2 days a week as we are still doing our classical language of Latin also. This slower pace has really helped Mikayla both in her Spanish studies but also in her Latin. I really loved the attention to detail that the author has put into the program. 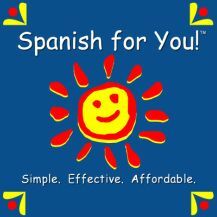 We have tried many Spanish programs in the past but none quite suite the needs of our family for the elementary level. I am happy to say that Spanish for You! does that and beyond! I plan to finish the rest of the Fiestas program and then move on to the Estaciones curriculum. Be sure to click on the banner below and read the Fiestas and Estaciones reviews of my Crewmates. Company / Product ~ Spanish for You! Price ~ Each theme set includes materials for all grade levels and retails for $64.95. Grade level specific packages that contain only the files needed for a specific grade level – 3rd-4th, 5th-6th, or 7th-8th retails for $39.95.